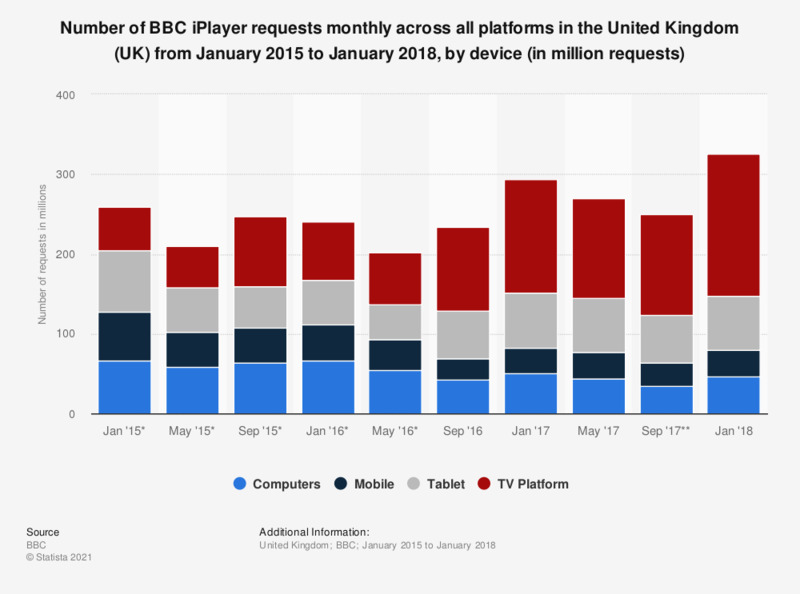 This statistic displays the number of BBC iPlayer requests made monthly across all platforms (TV and radio) in the United Kingdom from January 2015 to January 2018, by device. During this period of time, the number of requests for dropped for computers, mobiles and tablets. The number of requests rose sharply through TV platforms however, climbing from 55 million requests in January 2015 to 178 million requests in January 2018. * The source states that the source which they used to gather data changed after May of 2016. ** In the source document, figures for September of 2017 were missing. Figures were obtained from a previous release of this report. For more information about methodology , please see the source document.